Jutting out into Cook Inlet on the western tip of Anchorage, Kincaid Park is one of the largest in the city. But don’t let proximity fool you. With nearly 40 miles of walking trails, 20 miles of single-track bike runs, browsing moose, and even the occasional bear, Kincaid Park is huge. Kincaid is at the southern end of the Coastal Trail, so it is as popular with casual bikers as single-track devotees. Fish in Little Campbell Lake, play disc golf on the 18-hole course, or even seek out a sandy beach hidden on the Cook Inlet coast. The drive into the park on Raspberry Road is one of the best places inside the city for wildlife viewing. 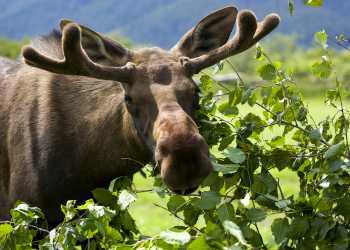 Moose and brown and black bears are often spotted along the road. From the chalet, park visitors get great views of Denali, Fire Island and the planes on arrival from all over the globe. The 1,400 acre park once held a cold war military installation. Sharp-eyed visitors might notice the chalet, a handful of maintenance sheds and other buildings were converted from old bunkers.